Don’t look any further if you are squeamish or easily offended. 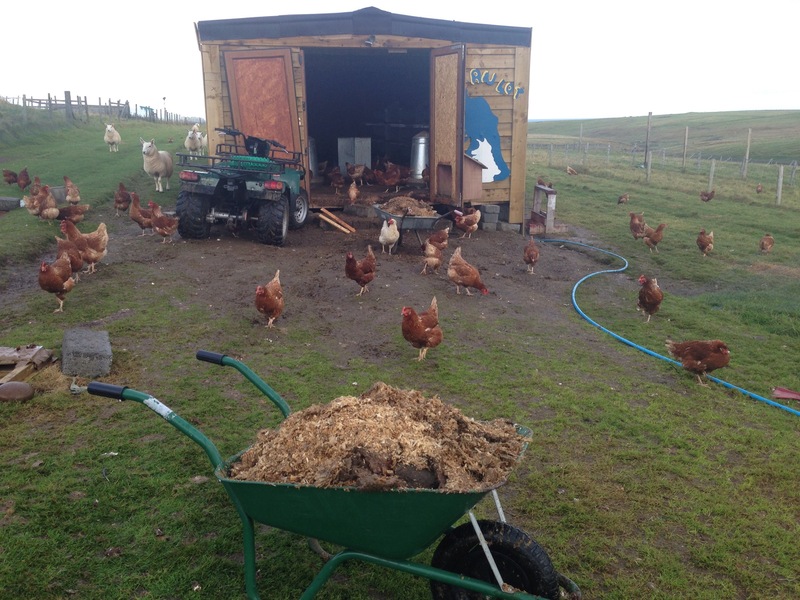 I was cleaning out the hen house earlier today and was just spreading the new wood shavings when I noticed a hen dragging something behind her. Her intestine…. 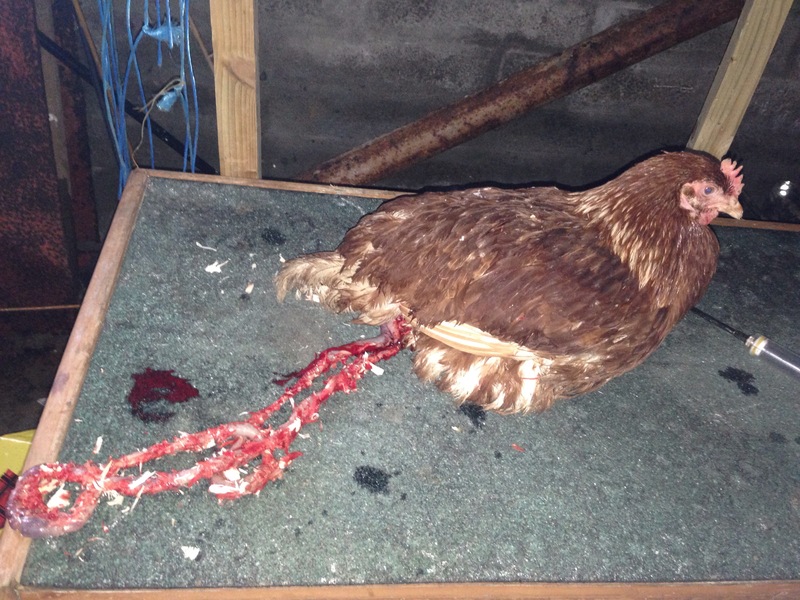 The other hens were pecking away as I lifted her up, and the entrails, and took her down to the barn. Unfortunately it was a total mess around the rear, so I culled her. Not nice. Anyone know what causes this? I am totally exhausted just now. The last 30 hours have been non-stop tension, fear and worry. 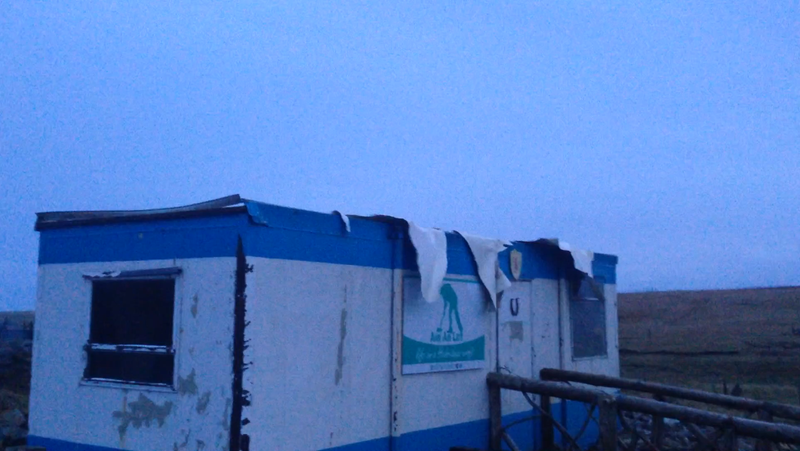 After getting everything tied down last night, I went to bed around 11, with the wind gusting around 70/80mph. I slept until 1.47am, when the wind woke me. This was the last sleep I would get until 5am, when I slept for a couple of hours. 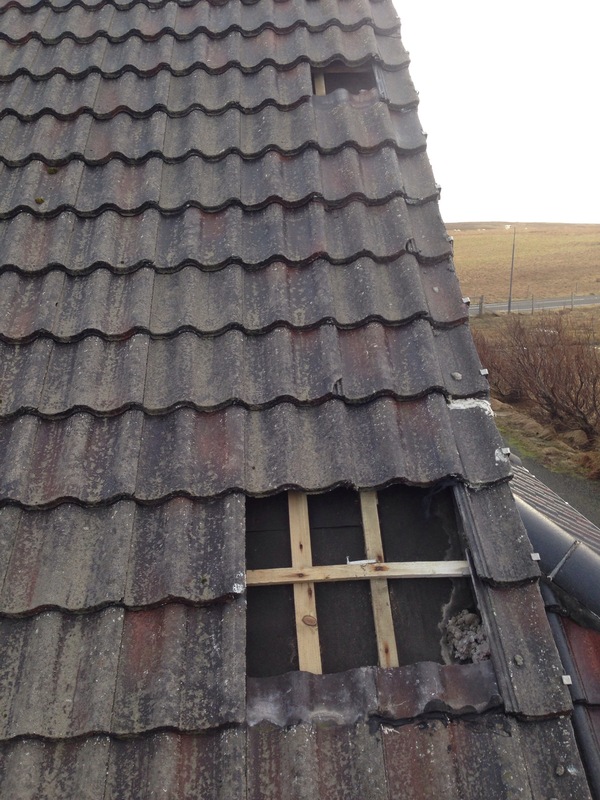 In the middle of the night, this was the sight that greeted me from the back door – the ‘skin’ on the roof of the portacabin torn to shreds. 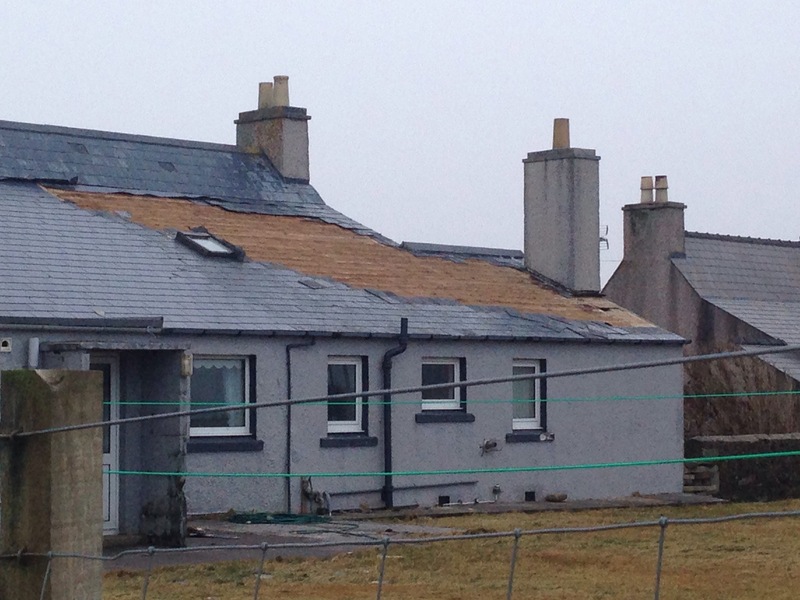 After checking the roof was intact, the hen house was next stop. 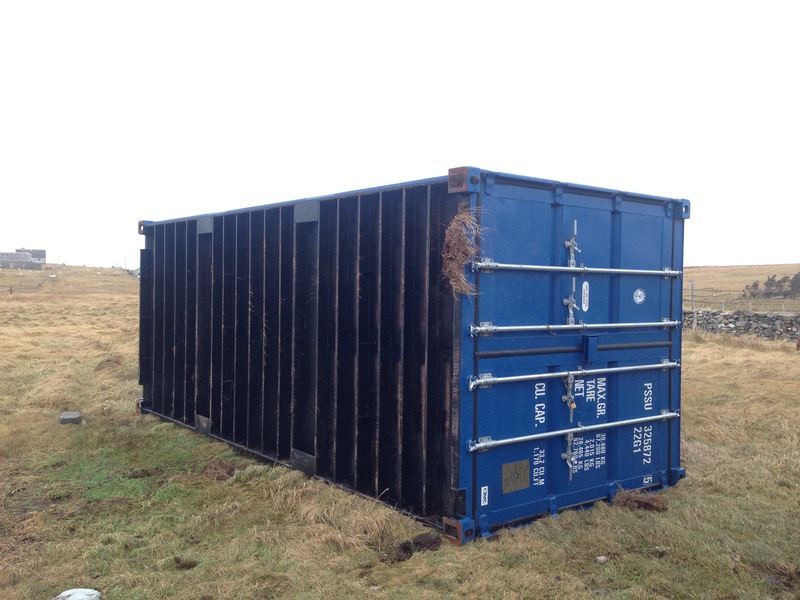 Fortunately it survived the storm, although there are possibly some issues with the doors, which will be inspected properly after the weekend – as long as it survives tonight and tomorrow. 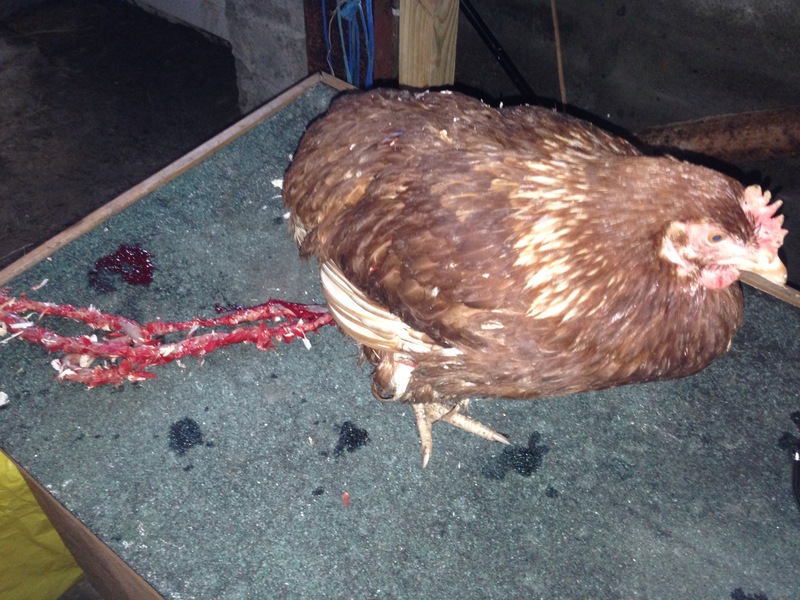 I found one hen dead outside, she must have left it too late to head back inside last night. 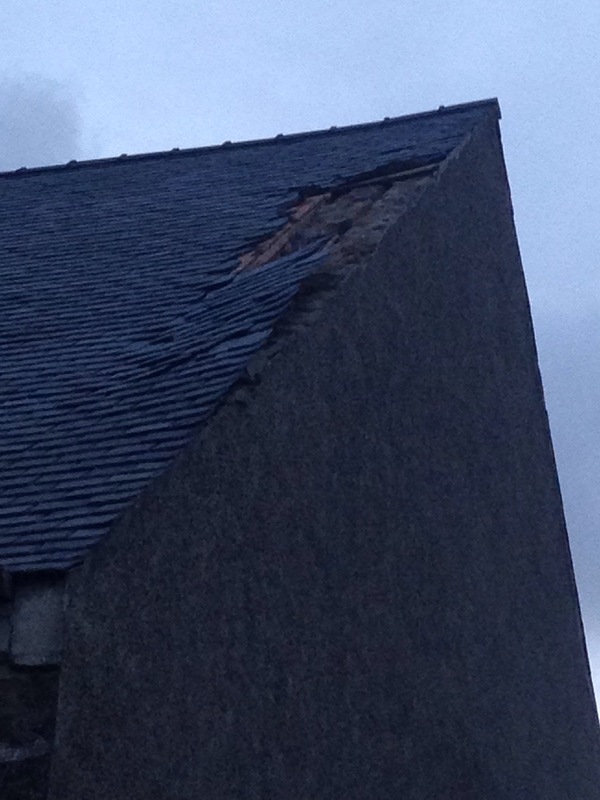 I had some damage on the roof of my house, slates missing and flashing torn, but not too bad. 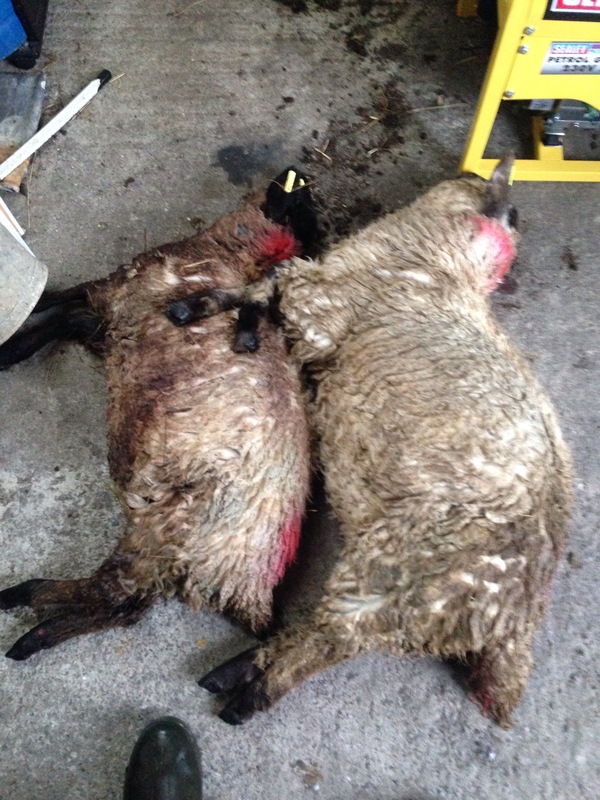 The lambs didn’t fare so well though, 2 dead with another apparently in shock. It’s inside and doing a lot better now. 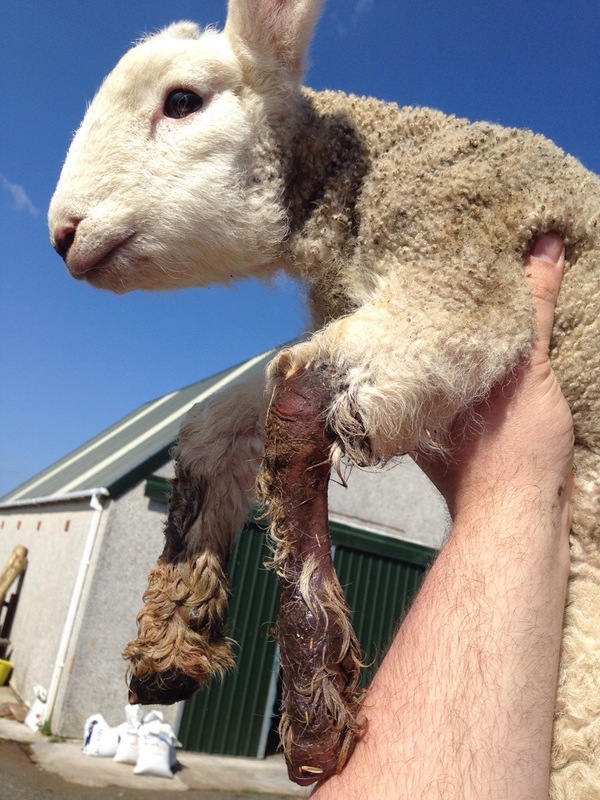 After moving the lambs to a more sheltered field, I saw the carnage that had been left – and that was only in 2 of the 15 villages in Ness. 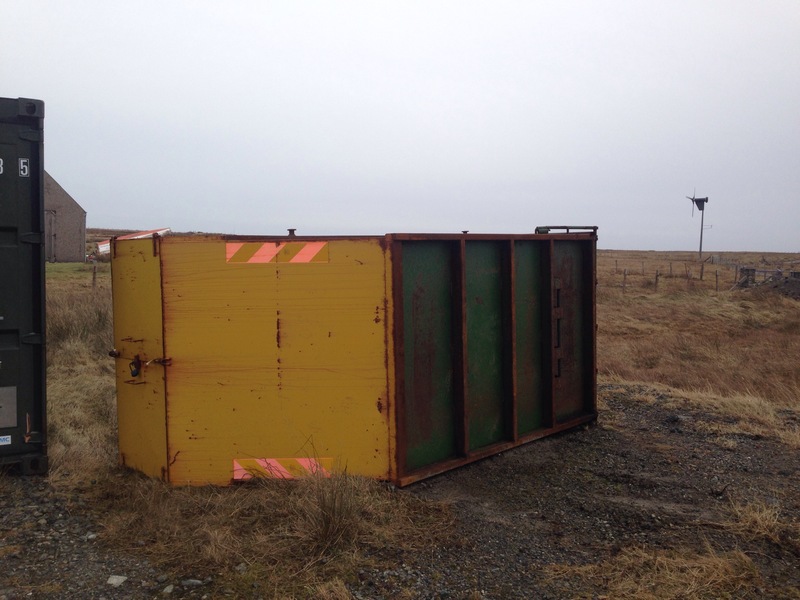 Shipping containers and skips blown over, houses stripped of slates and thousands of pounds worth of damage to the church. 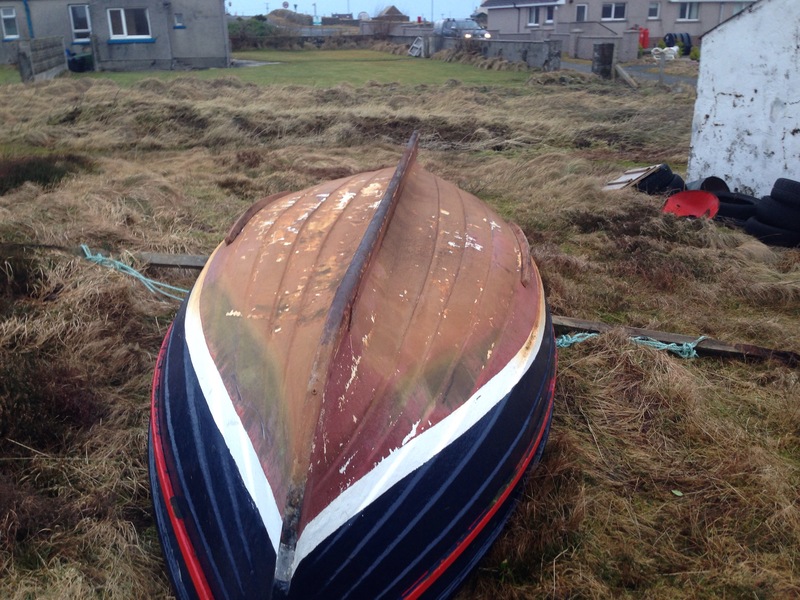 In my own village, this boat was flipped – despite being anchored down with blocks and tied to two fence posts, which were ripped out of the ground. It usually takes 6 of us to lift that boat! I’m in now and totally exhausted. I’ve been worrying and tense since 3pm yesterday and felt a wave of relief when I sat down at 6pm tonight. I just hope that everything makes it through the night ok. 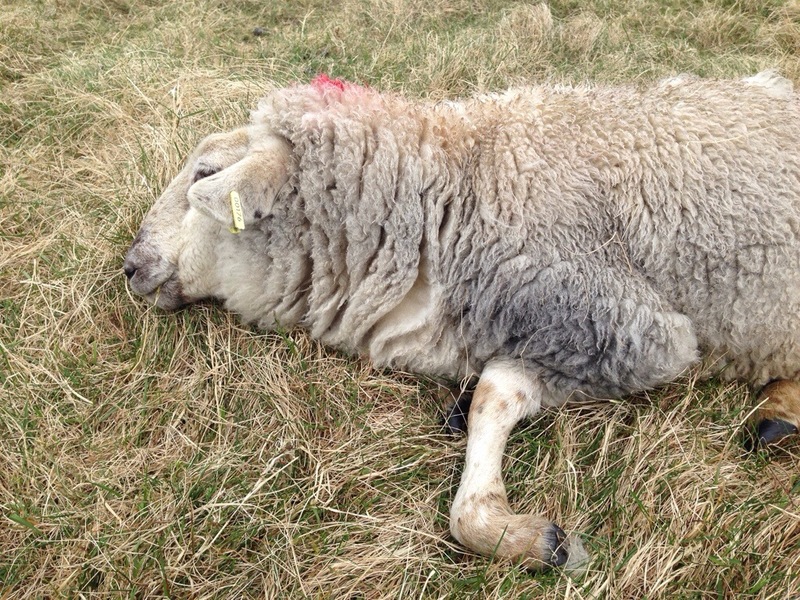 This week I lost one of my favourite sheep. I know that sounds a little bit stupid it was a lamb hand reared from birth. Lasarusina was touch & go to survive her first night last April, unfortunately she died 12 months later. I went to check the hoggs that I moved to Cross about 4/5 weeks ago. I check them about once a week and this time I found Lazarusina on her side, very weak. I took her into the shed and gave her food and water. With a bit of help, she managed up on her feet. 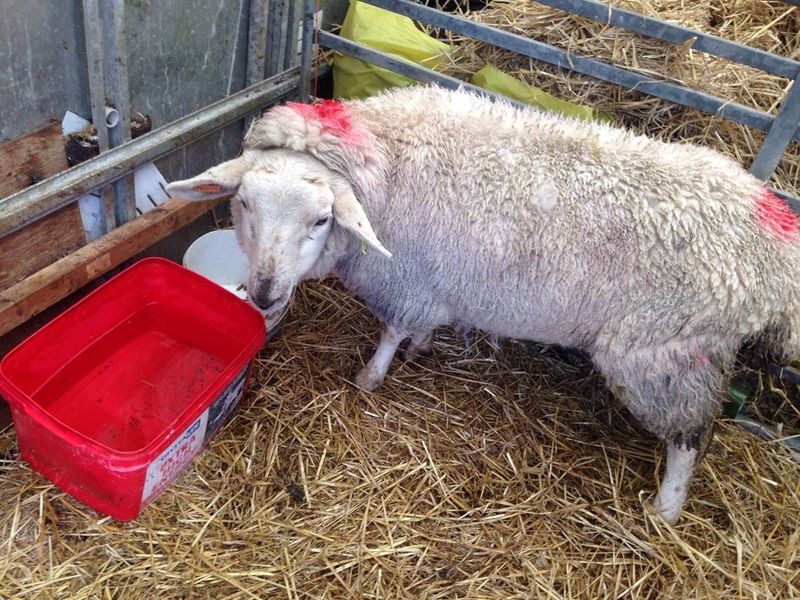 I suspected liver fluke so gave her a drench straight away. All the hoggs were drenched when moved to Cross, so it should have eradicated any issues then. I also phoned the vet but deep down, I knew it was too late. She lasted another couple of days but deteriorated. I eventually made the decision to have her put out of pain, but she died before I could arrange that. I’m lying in bed at 9.30 on a Sunday morning, thankful and relieved that lambing is over for another year. It’s my favourite time of year, but it is exhausting. I worked out that i was up at 5am in 32 of the last 35 days, with my dad doing the early shift those other days. 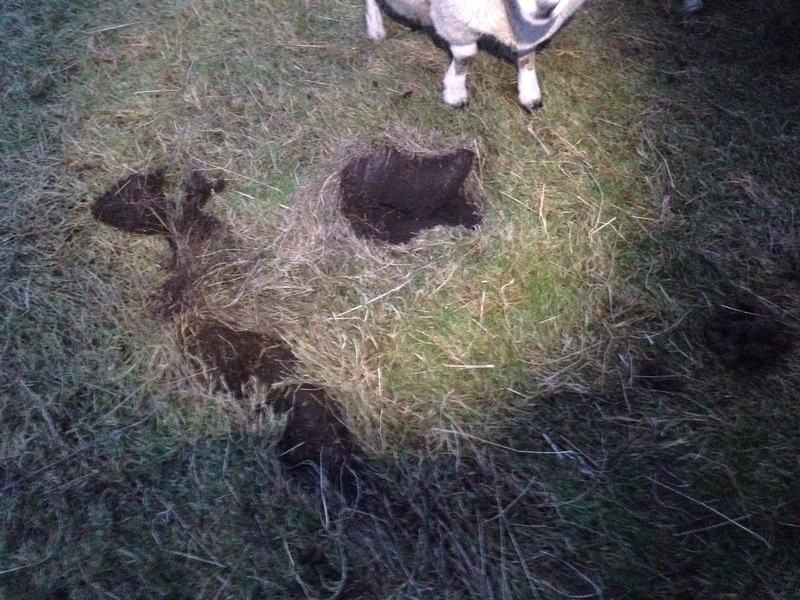 I’m not sure why this happened, but most of my lambing problems occurred late at night this year, whereas they were all early morning issues in 2013.
am finishes, and that makes it even tougher to get up at 5!! 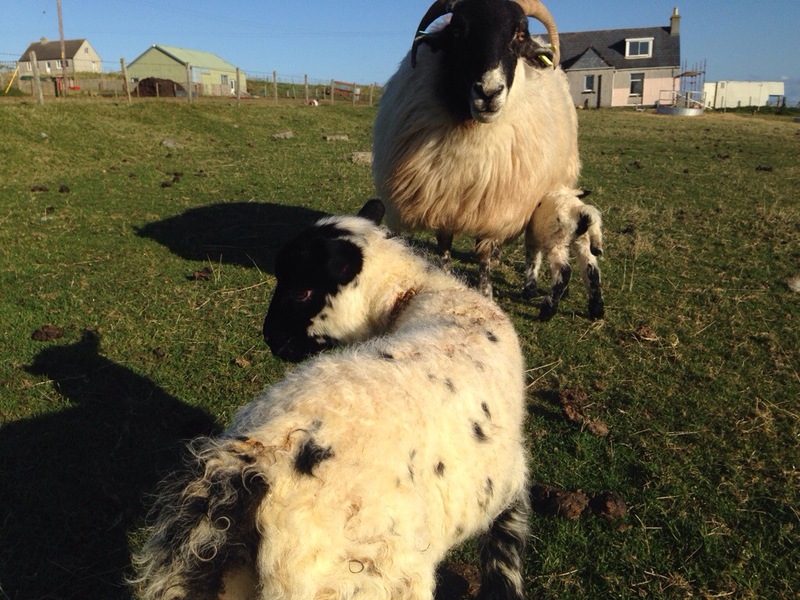 If it hadn’t been for the set of triplets I lost, I would have said it was one of my most successful lambings ever. 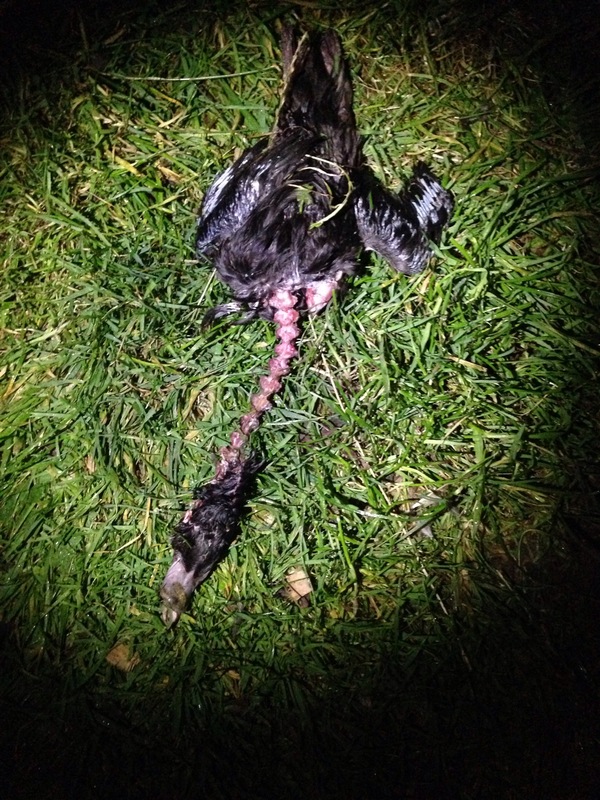 Quite often there are a couple of lambs lost to crows/gulls or simple stuff like membrane covering their mouth after birth. Fortunately none of that this year. 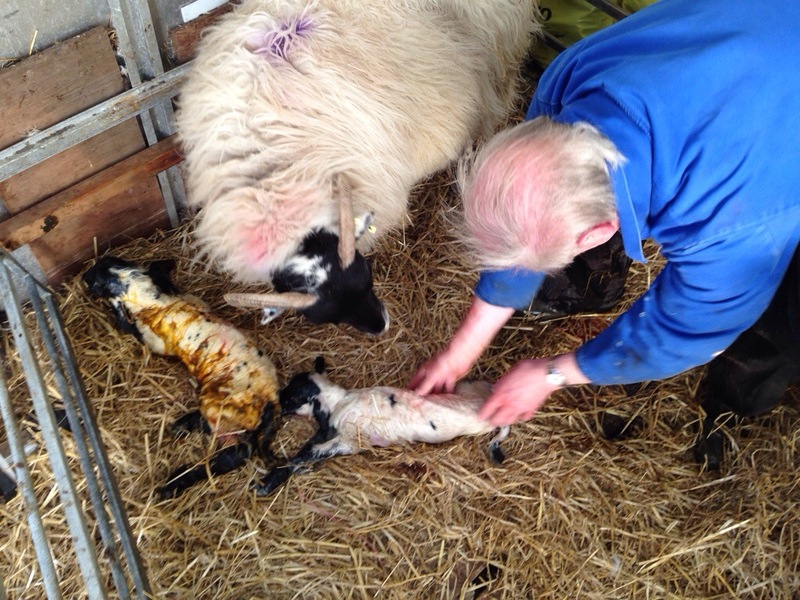 Every sheep has a lamb, except for the one that lost triplets (she was unwell for a week after her prolapse). The last one to give birth didn’t go as smoothly as I would have liked, but the lambs made it out ok. I came home from work at around 5.30, expecting to spend the evening tidying the house, as I’ve had workmen in. This was not going to happen! First thing I do is check the sheep that’s to lamb and noticed that her water has broken. Excellent, twins will be along shortly. Wrong. I waited patiently but after an hour or so, I decided to catch her and have a look at what was happening. I needed help doing this, as there was no pen in the field I was keeping her. We caught her, took her into the shed and discovered that it was a breech. That means lamb coming tail first. 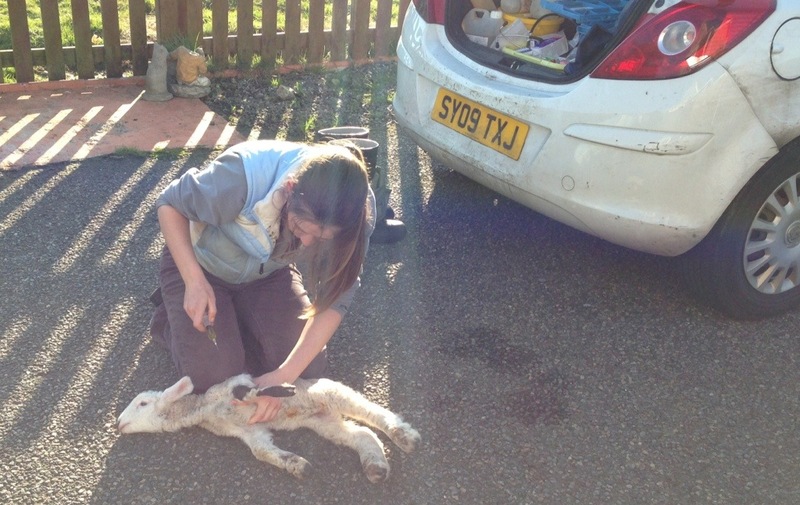 It didn’t take too long to get the lamb out. While we were discussing how long we should leave it before going in for the twin, out it slipped! Two healthy twins. So that’s it. Spent the night inside and let them out early in the morning. I’m going to make the most of my sleep for a while now! 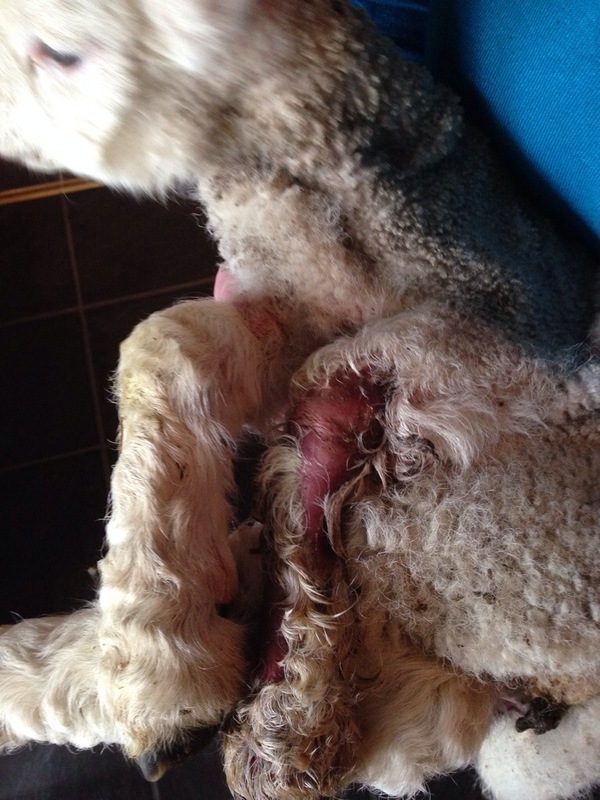 Last week I posted about a vet visit for a lamb that had swollen and bleeding leg. Unfortunately, that wasn’t the end of matters. 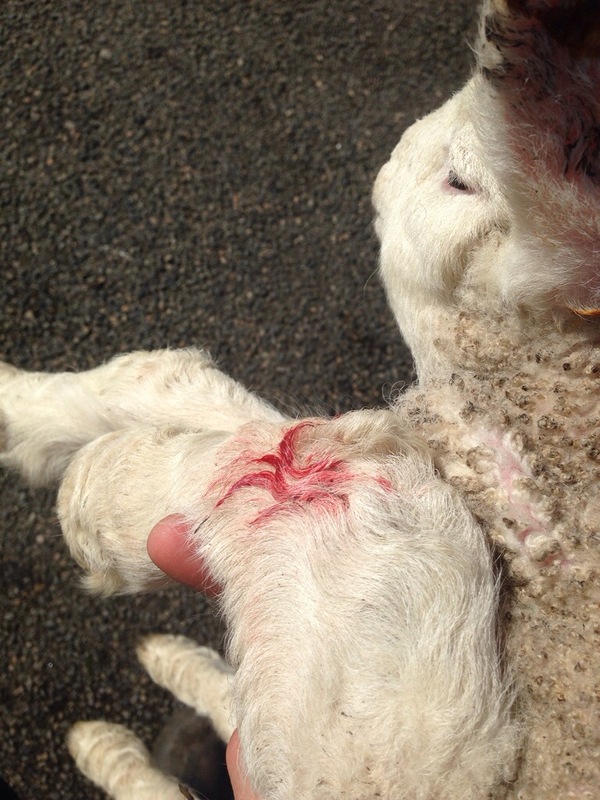 The lamb then lost the top layer of skin on it’s leg. 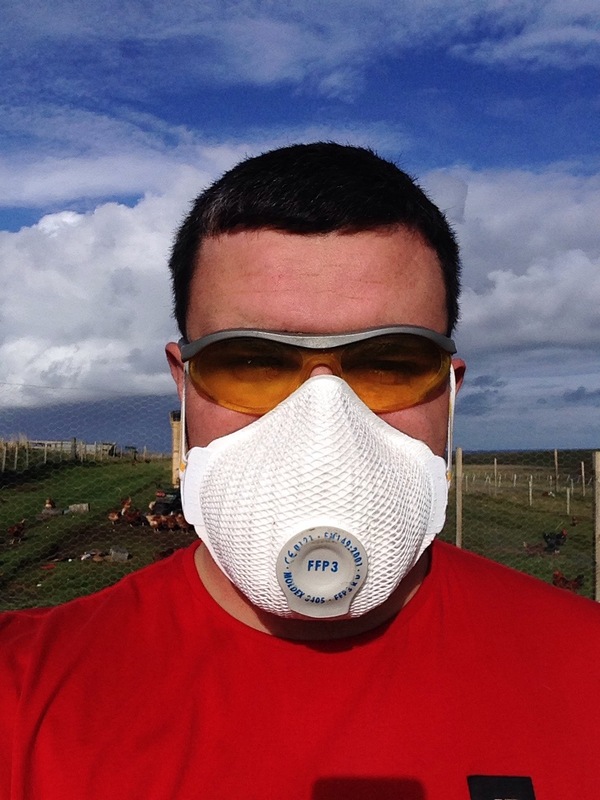 I was advised to keep it clean and dry and to cover it with vaseline. Basically treat it like a burn. So for 4/5 days, I took the lamb in, cleaned the leg with a drop of iodine in water, dried it and covered it in vaseline. The leg, however, got progressively worse. By Sunday morning, I feared the leg was dead. It was black and cold below the knee. For some reason, blood was not circulating as it should. I phoned the on call vet and discussed matters. I didn’t want to shoot it, just in case there was something the vet could do, but I already knew the outcome. 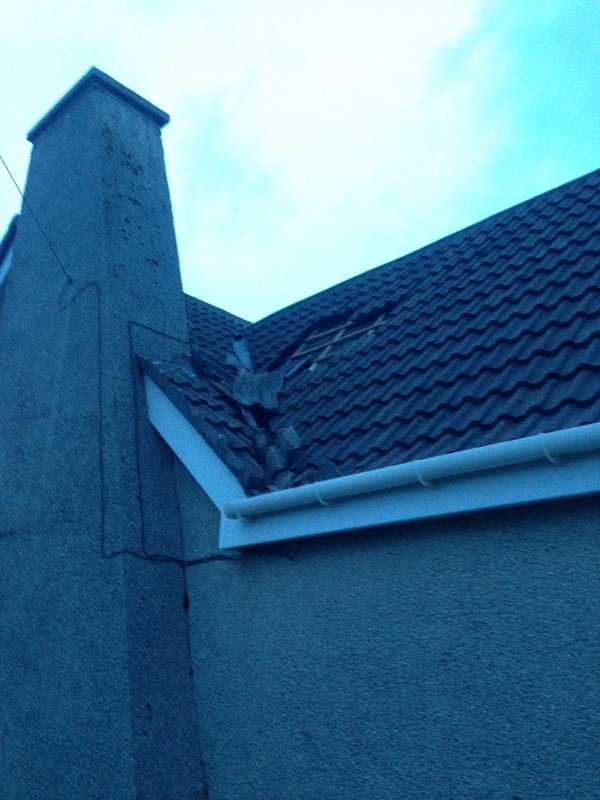 As it wasn’t an emergency, I told the vet to stop by if she got a call-out in Ness, which she did around 6.30pm. The diagnosis didn’t take long. Whatever was affecting the front left leg had also spread to the other 3 legs. There was little option but to have it put down. This was a swift and painless injection. 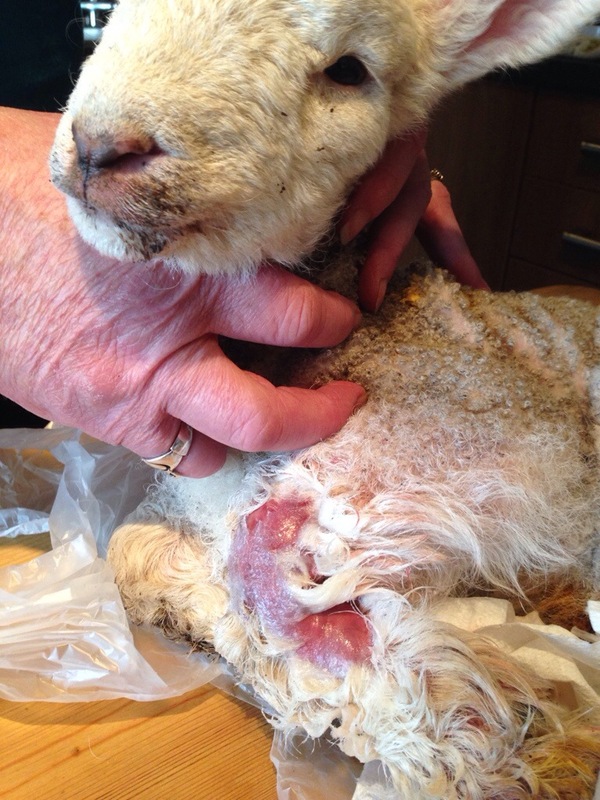 I’ve seen it done to numerous other animals, but never a lamb. Because they’re so small, it’s injected straight into the heart, meaning they die instantly, instead of the few seconds it takes for a larger animal. I think the worst thing about this experience was how lively the lamb was. 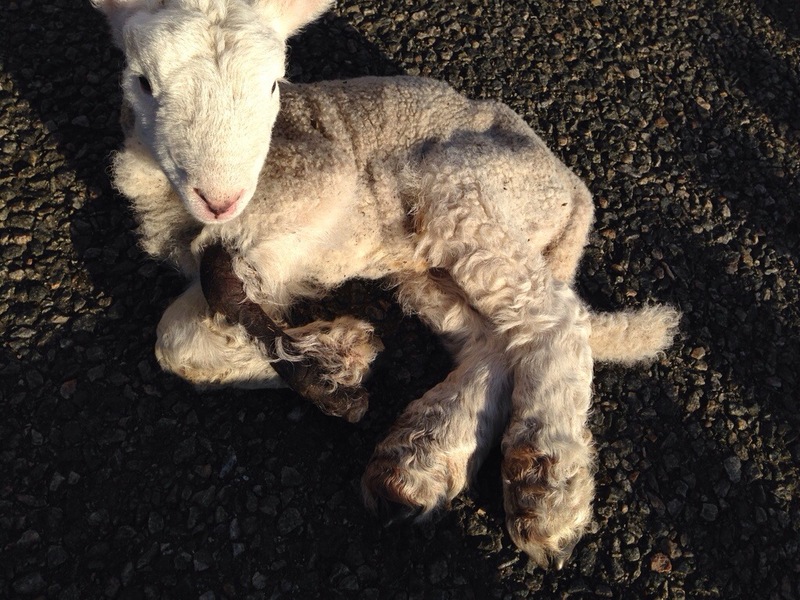 If you didn’t see its legs, you would have thought it a strong and healthy lamb, as shown here.